This post strays a little from the norm from our usual fare...but please bear with us. Witness the picture above of John Unger and his dog Schoep. 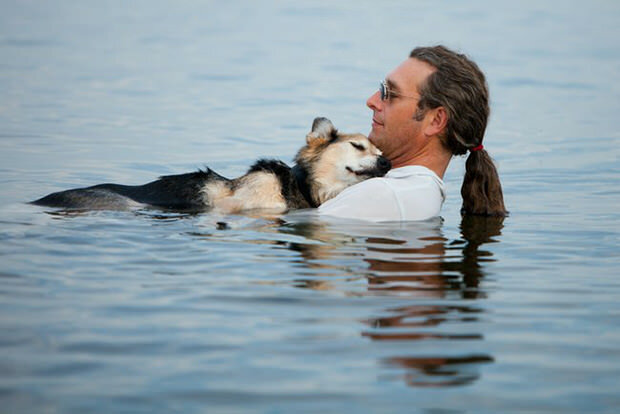 John rescued Schoep when he was 8 months old, and have spent the last 19 years together. Truth be told, Schoep saved John from suicide after a particularly difficult break-up from a former fianceé...so they're even. Schoep, being the age that he is, has developed arthritis in his legs...eventually giving him sleeping problems. John discovered that being submerged in cool water seemed to soothe Schoep's pain, and thus started taking Schoep for a dip in Lake Superior for a pain free nap in his arms. Have you teared up yet? Being pet owners ourselves, we having a soft spot for the dog lover, and this story takes the pet/owner bond to the next level. Of note, the picture was not staged, and was snapped by photographer Hanna Stonehouse at Stonehouse Photo.